Pristine beaches, luxurious all-inclusive resorts and world-class golfing are the main reason many choose to book a Dominican Republic honeymoon. The Dominican Republic occupies half of the island of Hispaniola in the Caribbean. The terrain is varied with rainforest, beaches and impressive highlands including the Pico Duarte which is the tallest mountain in the Caribbean chain. Several options for a great Dominican Republic honeymoon are available with options ranging from an upscale, all-inclusive resort in Punta Cana to an adventurous itinerary exploring the island’s mountains, rainforests and national parks. Snorkeling and scuba diving are both popular activities off shore as is whale watching and fishing. Several historic sites provide a bit of context to the island’s culture and include a Spanish Fort and an impressive monument built in memory of Christopher Columbus. Dominican Republic honeymoons are quite popular nowadays, and it's easy to see why. The most popular and most expensive time for a Dominican Republic honeymoon is from December to April which is noted for its beautiful weather. Rainy season is from the end of May until the end of November. This can be a good time to get a good deal if you are okay with a shower here and there and the slight risk of a hurricane. Bavaro A beach resort area in Punta Cana along country’s east coast popular with Dominican Republic honeymooners. Characterized by coral reefs, upscale accommodations and golfing. Los Haitises National Park A very remote national park with diverse plant life, mountains, islets and mangroves. Samana Bay A bay on the country’s eastern coast with a number of protected islands, wildlife, mangroves and whale watching. 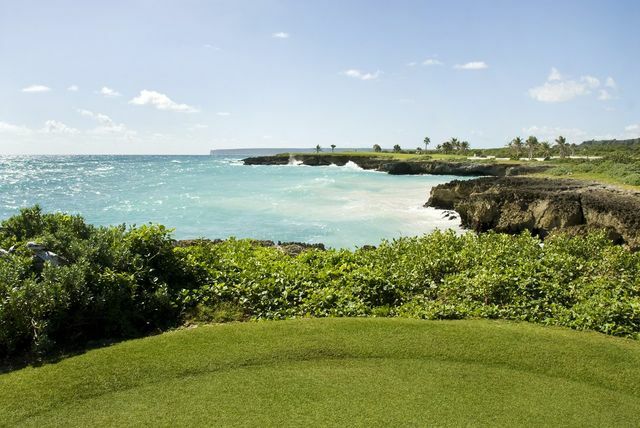 CAP CANA An exclusive, high-end resort area on the country’s eastern shore with sandy beaches, a marina, and golfing. Los Tres Ojos An open-air limestone cave that extends some 50 yards in the Mirador del Este Park—ideal for adventurous Dominican Republic honeymooners. Columbus Lighthouse A lighthouse-inspired monument with light display, dedicated to famed explorer Christopher Columbus. Bahia de las Aguilas An 8km long stretch of sand near the southern border with Haiti in an area known for camping and nature preserves. Lake Enriquillo A saltwater lake surrounded by wetlands that form a habitat for iguanas, crocodiles and other wildlife. Fortaleza San Felipe A late 16th century Spanish fort built to protect from pirates. Today there are history displays inside. Pico Duarte The highest mountain in the Dominican Republic and all of the Caribbean. Hiking and climbing are both popular here. Dominican Republic National Aquarium A public aquarium with various educational exhibits, marine animal habitats and guided tours. General Gregorio Luperon House The former home of the general which has been converted into a house museum about his life. Best Resorts in Cuba, Jamaica or Dominican Republic?